This post was done by a dear friend and sent to me on Easter Sunday, 3/27/2016. I was surprised and honored by her heartfelt post and it seemed more of an award than the others posted here. I will insert the post here as well as a link to her website because she is an amazing writer on her own and needs to be read by everyone! Truthfully, I don’t know where to start to describe this author! If you aren’t following her blog, or are one of her Writing Rebels, or following her on Twitter, or reading her monthly submissions at Downtown LA Life online magazine, well then you are missing out. BUT, you can get a glimpse of her talent and energy! She writes for herself and with a passion for what she is writing. She shares of herself unstintingly in her poetry/prose in a way that touches you. Truly there is magick in her words! Go to Amazon and get one of her books. Just click on the word Amazon wherever you see it in this posting and it will open in a new window to her author page at Amazon where you can pick up one of her books. Remember … to buy one of her books, just click on Amazon . Not sure you want to go to Amazon ? Well, why not go to her blog, Annie’s Muse and read a bit there. You can get a taste of her writing there. Some biting, some humorous, some wistful, haunting and some just takes to another plane. No matter what, the passion of Texas is there beating in her heart. She also shares her writing at Downtown LA Life Online Magazine in not one but two features! One she shares her delicious recipes from her life growing up with a surprising twist to them and in the other is always a wonderful short story either of fiction or from her life. When from her life, you may laugh, but you also may cry. Annie gets it right each time. Oh I’m not done yet! Are you a writer? Do you ever find yourself in a rut, blocked, needing a push? Then you need to join Annie’s Writing Rebels! That’s right … this busy woman also has a blog where you can each week on Sunday, find a prompt to write to. Annie’s prompts are challenging and stretch your writing muscles! It is here that I must interject and just say that without Annie having done this, I would not have found my voice and probably would have given up on writing all together. I was floundering in the micropoetry world and had figured I might as well hang it up. Annie began her Writing Rebels and despite my absolute fear at my even attempting to produce anything nearly credible as writing to this zealous author was daunting. Now … if this hasn’t made you want to go to Amazon and buy one of Annie’s books, then I don’t know what else would make you! Shelly’s post left me both speechless, honored and in tears off an on all day Easter Sunday. We receive Blessings unexpectedly and this was mine for this year. My deepest heartfelt thanks my friend … I love You. 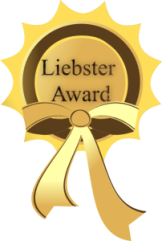 Lauren Jeffery nominated me for the Liebster award. I am honored by her nomination as a fellow writer! No, but hopefully some day! Beach — Sun on my Skin, Sand on my Toes and a Margarita in my Hand! A bit of both…depends on the situation and people I am around. I have self-published and plan to continue. My editor at DownTown LA Life is encouraging me to publish a book of the short stories we are featuring there. I would not be a Kardashian — they hold no appeal to me whatsoever. As a little girl I wanted to be Antoinette and be called Toni! My career as an educator … now retired. That’s it. Thanks again to Lauren and to everyone who reads my posts! 3. I write poetry every day. 4. I have a personal writing challenge for 2014, but am not ready to share. 6. I write short stories nearly every week. 7. I am happily retired! 8. I cannot spell for squat. 9. I love good art but cannot draw a straight line with a ruler. 10. I love to cook. 11. I am the Contributing Editor for the International Online Magazine DownTownLA Life http://www.downtownlalife.com where my short stories are featured monthly. What a wonderful surprise this afternoon when I opened my notifications and found a note from Alicia that she had nominated me for the Sunshine Award. Big HUGS and thanks Alicia for this honor. 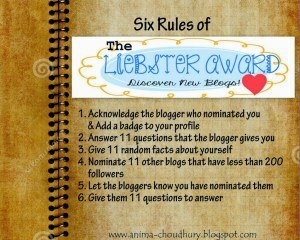 I’m breaking rules left, right and center but I’m not going to nominate 15 blogs, instead I’m nominating six blogs I really enjoy reading! Yep, I agree with Ellen…doing the exact same thing! Thank you so much — humbled and honored Alecia! Alicia … OMG … so humbled and honored!